Beginning Friday, September 18, the annual Purge will commence at Halloween Horror Nights at Universal Studios Hollywood and Universal Orlando Resort as both parks debut all-new disturbingly-real experiences, inspired by Universal’s popular franchise film series! Guests will attempt to survive the night as they are immersed in the film’s depraved world, where all crime is declared legal as part of the government’s annually sanctioned 12-hour Purge. 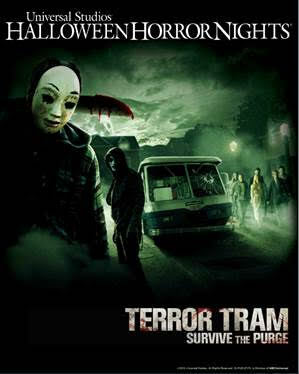 The “Terror Tram: Survive the Purge” experience at Universal Studios Hollywood will pit guests against morally-compromised citizens, who take to the streets to cleanse the country of those deemed as less desirable. A newly endorsed “Purge Party” will also welcome guests to honor this proud national tradition by watching the night’s dramatic events unfold on large video screens set up around the famed Universal backlot – until the experience quickly turns into an unforgettable living nightmare.